Welcome to Barefoot Hideaway. The perfect cabin to be surrounded by nature and get away from it all. 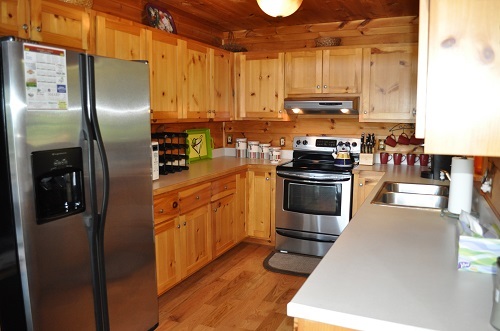 This cabin is tastefully decorated and fully equipped with all the comforts of home. The main level has a spacious open great room with a gas log stone fireplace. A large dining room and kitchen with stainless steel appliances. Two bedrooms (both queen beds), two full bathrooms along with laundry facilities and a covered back deck with a gas grill. The upper level has bunk beds, half bath, air hockey table and a large sitting area with TV/DVD player. Perfect for the kids! 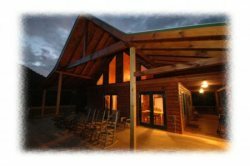 Take in all the peace and quiet of mountain solitude while you enjoy a good book on the screened porch while sitting in the rocking chair or the hammock, soaking in the hot tub or roasting marshmallows around the fire pit. Take advantage of the unique shopping in the quaint towns of Blue Ridge and Ellijay the Apple Capital of Georgia. Don't miss a visit to Mercier's Orchard in the fall. Where you can pick your own apples. Take a ride on the Blue Ridge scenic train to Tennessee. Lake Blue Ridge Marina has boat rentals. There is white water rafting on the Ocoee or tubes and kayaks for rent on the Toccoa. Hiking to a waterfall , swinging bridge or on many of the other trails in the area. Horseback riding, mountain biking. Or maybe even catch a movie at the Swan drive -in. There are so many activities to enjoy in this beautiful area. Don't waste another minute, book your stay at Barefoot Hideaway today!